There was Sanjay Leela Bhansali’s stunning Padmaavat two weeks ago. There is the stunning-in-its-own-right Pad Man this week. There is the period film. And then there is the film about the periods. Excellence comes in many packages. But rarely in a small secret package wrapped a newspaper. Sometimes these packages cost Rs 55 and are completely out of reach for the non-urban women of India. One man in Tamil Nadu, who is miraculously a convincingly-transformed North Indian in Pad Man, decided to do something about making sanitary pads affordable to poor women. The thought was not just unmentionable, but also outrageous. It still is.The pain humiliation, strife and final victory of Laxmikant Chauhan is narrated in a series of quickly-cut quirky bitterly humorous episodes (editor Chandan Arora can take a bow) that could easily have become caricatured, preachy and propagandist. Pad Man is none of the above. It celebrates the spirit of enterprise with enrapturing integrity and tempered gusto, rendering the saga of Laxmikant Chauhan’s journey from familial humiliation and spouse-deseration to a PadmaShri addressing the United Nations. One of India’s finest cinematographers P C Sreeram makes Laxmikant’s audacious odyssey a visual manifestation of a life that defies logical definition. Pad Man has two heroes. Akshay Kumar and PC Sreeram. But before we get there, a word on the cinema of noble intentions that seems to have run out of steam in these times of perverse dreams. Nobility in these cynical twisted times when little girls get raped and big boys sell state secrets for big bucks, is not a quality we value in art. 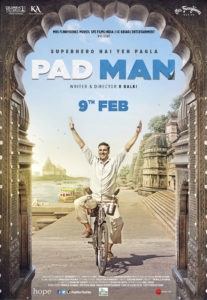 Given the premium we place on selfinterest the sheer generosity of spirit that R Balki displays in his fifth feature film—and by far his finest work—should be reason to stand up and applaud PadMan. But wait. Hold on to your seats. There is much more to celebrate in this wonderfully motivated film, a tidalwave of menstrual liberation that sweeps us into its charming folds like an old grandmother in whose arms we would cuddle and forget the worries of the world. PadMan possesses a rare innocence and charm. The proclivity to live a life of utter selflessness that seeps out of every pore in its protagonist’s heart, comes pouring out of every frame, wrapping us in a feeling of bonhomie that captures life’s most cherishable emotions. It is very hard, almost impossible, to forget the protagonist, a true hero of our times, Laxmikant Chauhan. And not only because of the luminous way the character is written by Balki and his co-writer Swanand Kirkire. It’s the way Akshay Kumar plays Laxmikant, a man driven to insane bouts of audacity by the passion to diminish the pain that women experience for 5 days(disparagingly referred to as ‘test match’ by the boys of the mohallah) every month. Balki adopts a simple straightforward linear narrative mode, leaving behind the swag and swagger of Chini Kam, Ki & Ka and the underrated Shamitabh to focus on the man and his mission with a singlemindeness of vision shared in equal measures by the protagonist and the filmmaker. There are passages of keen satire rubbing shoulders with fleeting images of deep contemplation in the supple sturdy and rugged storytelling,all merging in a marriage of Pure Cinema and Social Statement. The narrative does tend to overstate its case. And there are sequences such as the one between Sonam and her screen father in a car at the end, which smack of over-explanation. But most of the time Balki knows where to hold back and where to let go. The pauses in Laxmikant’s saga are rarely filled with irrelevance.Balki and his leading man won’t allow a life so rarefied to be inured in nonsense. While Radhika Apte as Akshay’s wife is uncharacteristically over-the-top in conveying a woman’s menstrual anxietie s(at times she behaves as though the wife Gayatri has her time of the month for the entire month) Sonam’s Pari is a delight. The actress plays a table player and an incorrigible do-gooder and Laxmikant’s biggest support, all without toppling over into excessive sweetness. The kiss she shares with her co-star is a little…ummmm…out of place. But that’s okay. No one and nothing is perfect. The film belongs to Akshay Kumar. Make no mistake about that. Playing Laxmikant with a mixture of inbuilt ingenuity and curiosity he makes the man believable and endearing, so compassionate and inspiring. As Laxmikant Chauhan/‎Arunachalam Muruganantham, Akshay Kumar’s rousing speech at the UN is the showreel that will be shown when he gets his first lifetime achievement award. In the meanwhile, do reserve every single acting honour of 2018 for this performance. Arunachalam Muruganantham is not North Indian. But after watching Akshay Kumar play him, I wish he was.